Easily make new friends, and not just out of pity (I think). Fully realize the support of the triathlon community at home. Fully realize the support of the satellite NYC community who were at the race. There is not much to note leading up to the race other than the usual scouting, so I'm going to skip right to the race! The swim was in the Tennessee River in a trapezoid shape. Within the age group waves, the start was a rolling start. We lined up into about 6 chutes as we approached the edge of the dock. About every 20 seconds, a clock beeped, and volunteers stood in front of the chutes with their hands out so that no one could start too early. When it was time to go, I ran out of the chute, ran 3 or 4 running strides, and dove with my best streamlined position into the water. I felt like Michael Phelps on a relay team, if he was allowed to run up onto the starting blocks. We swam under both of those bridges on the far right! After 300 meters, we swam against the current for 860. I heard from a few people that the power plant upstream has some control over the current, and I could feel the decrease in current compared to the practice swim. Times were still about 2 minutes slower than usual, but I didn’t let that get to me in the swim. Since I was too far from either side of the river to gauge how fast I was moving through the water, I perceived the water wooshing past me as all self-generated, like the water was coming at me so hard because I was pulling it so hard! Whatever works, right? While I could feel the current against me, I couldn’t really feel it going with me on the other two sides of the trapezoid. Disrobed but not distressed, I grabbed my wetsuit and bag and ran to the “changing area” to remove my helmet and shoes and put my wetsuit in its place. The whole T1 was such a blackout-feeling whirlwind, because it took three listens until it sunk in that we could leave our bags on the ground and that they’ll get picked up. Thankfully, there was a volunteer who kept repeating “leave your bags where they are!” I did just that, clipped my helmet on the way out, and carried my bike shoes to my bike. The transition area before it was full! There were two separate areas for men and women. I ran on the red carpet for 200 meters past the changing tents until I reached my bike. I tossed on my bike shoes and hit the road. After 5 miles, the famous climb up Lookout Mountain began. The climb consists of 1000 feet over 3.5 miles with an average grade of 6%. For the NYC cyclists, it’s 2 percentage points steeper and a half mile shorter than Bear Mountain. I couldn’t believe how many people I passed who were grinding out 50-60 RPMs and making me look like a drug cheat. The descent was almost worth all the climbing. I ran out of gears quickly, but the descent was curvy enough that I wouldn’t have pedaled anyway. For the rest of the ride, I focused on taking a Gu every 20-30 minutes, drinking water, and maintaining the same effort. I finished the ride in 2:49:19 and 19.95 mph. I did my first flying dismount in a race. I had practiced it three times in a triathlon T2 simulation with Laurel Wassner and nailed it all three times. However, I was coming in as hot as the newest Taylor Swift album. I swung my right leg over to the left side of my bike and saw a girl was dead stopped in front of me, not moving, and I thought, “Now we’ve got problems, and I don’t think we can solve them…” As I took my third and fourth steps on the pavement, my bike started to lean into me and we both toppled over to the left. I hit the ground and served as a crash pad for my bike, which was thankfully OK (not that checked right away; I waited until after the race to "take a look at what I’d done..."). I got right up, shook it off, and ran my bike to the bike catchers. 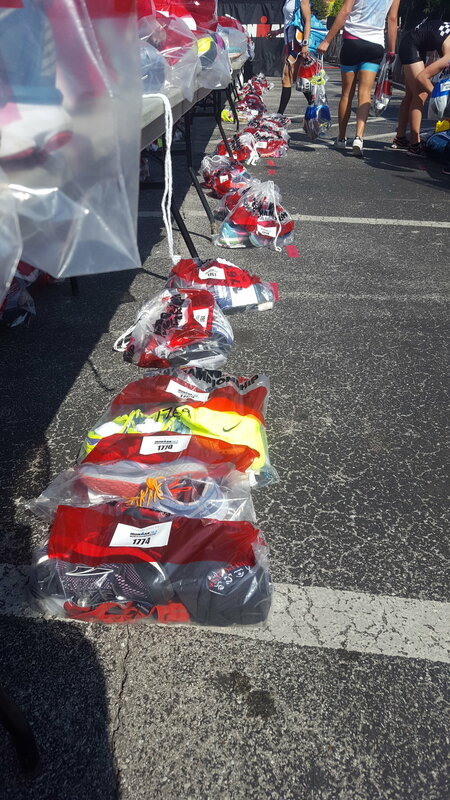 I grabbed my T2 bag, grabbed my Trailyx sunglasses, New Balance running shoes, and bib belt, and put my helmet inside. 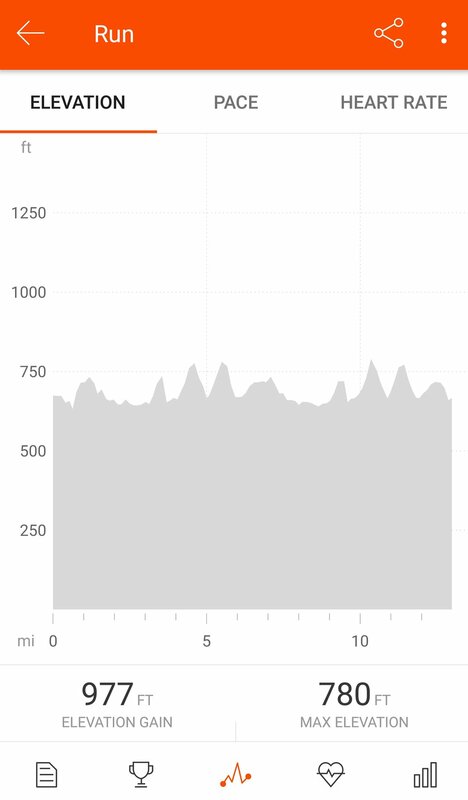 Knowing the run had 1000 feet of elevation gain, which was very similar to Rev3Poconos, I expected my splits to yoyo between 7:20 for the uphill miles ad 6:20 for the downhill miles for a 6:50 average pace. This started out as the case, and I gained at least 10 seconds for the first mile just by hearing the cheers of Emily, Jean, and Sara, who had flown down to Chattanooga just to spectate Hallie, Sara, me, and a few other athletes and pros they knew racing. The yo-yoing of pace only lasted 4 miles. By mile 4 somewhere in the middle of a 100 foot climb, my left quad seized up into a ball that felt like would rip off the rest of my leg. I took about three walking steps up the hill and resumed running, mostly because I was afraid to stop. I took my first of eight(!) salt tablets as soon as I had some water from the next aid stations. The next 9 miles were all about managing my hydration and electrolytes in the 80 degree heat. I took two more Gus, seven more salt tablets, eight more sponges, and 17 more cups of water and Gatorade. Ice was hard to come by and dispense; one volunteer poured ice from an ice scooper into my hand. Unlike the hills of Rev3, the ones on the Worlds course were so steep that there was no way to fly down them and reap the benefits of the work put in to get up the hill. Every time I wanted to slow down (more), I thought about Coach Cane, NSQ, and my family and friends at home watching my splits every 2ish miles and not wanting to concern them. The entire last hour was a practice in damage control interspersed with encouragement and photographs from NYC triathlete friends Gerry and Cesar and eruptions of cheers from Emily, Jean, and Sara. These ladies were so loud and encouraging, I thought about checking to see if the cheers were for David Beckham behind me holding hands with Marcel Kittel while sporting David’s newest line for H&M. The splits and elevation map tell the story pretty well. 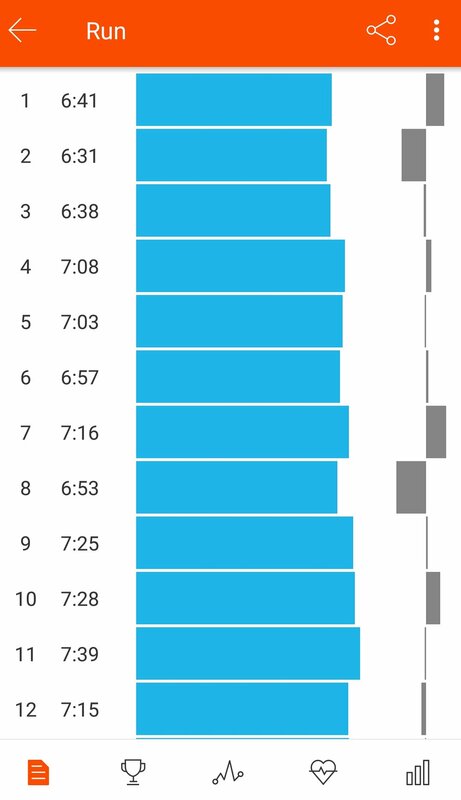 I ran down the final hill to the finish and felt like I finally let loose and was flying, though my 7:16 pace said otherwise. I really tried to soak in the final 100 yards of the race. Just like I was rewarded with a beautiful descent after climbing Lookout Mountain, this race was my reward for all of the hours of training and practicing. Race day is both a test and a celebration of hard work. Failing to recognize both is a cause for burnout or underperformance. Fellow Bucknell alum AND fellow Nicole, one of the first people I saw after the race! Partially because I knew I should eat something right away and partially because I like to take advantage of the not cheap race registration fees, I got food from the race. For some reason, I opted for the richest food they had, chicken mac and cheese. I ate some of it and got this really beautiful picture of myself. I don’t look like I belong on a magazine cover, but it’s raw and honest and I love it. I had dinner that night with Hallie’s family, Emily, Jean, and Sara. We rehashed the race and made a plan to watch the men the next day. This was the first World Championship where Ironman split up the men and women, which I really liked. I noticed it the most on the bike course, where there were no men blasting past me on the descents. I also noticed in the lack of congestion on the bike course and ease of getting to the aid stations on the run course. The next day, I met Hallie and friends to cheer for the men’s race. I took some really terrible pictures because I was so focused on catching the pros and age group men. I cheered for Jesse Thomas as if he were my own son. At lunch after the race, I was sitting two tables down from Javier Gomez-Noya. Once he was done eating, I got to meet him (thanks to Gerry), and he was so, so humble! I asked if he had ever done a 70.3 race that difficult, and he said he’d encountered a bike course that difficult, but not a run course. I almost didn’t believe him, since he didn’t seem to slow down much on the run course with his 1:10 split! I went to awards that night and sat with friends I haven’t met yet. Most of the people I knew had gone home already, which was smart because of Hurricanes Harvey and Irma making their way up the coast. The top 5 in each age group make the podium, so I was happy (as was my table!) to be invited on stage and shake hands with Mark Allen and Dave Scott. Elated, but in the back of my mind, I'm wondering how I'm going to be able to get this thing home in addition to the towel, backpack, hat, and bottles of exhaled air from Jesse Thomas I captured on the course. Me and all my franz. Just kidding, they left the 4 hour ceremony a little early. Didn't want to put it on the ground; didn't want to leave it unattended either. What's next? Downtime! What does downtime mean for me? I have strong feelings about that, and I'll write about it in my next post!